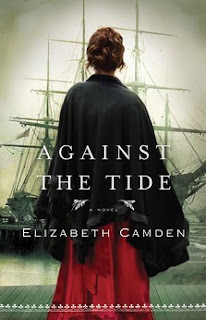 Elizabeth Camden is a fairly new to me author. The first book I read by her was Into the Whirlwind. I loved her style of writing and the twists she added to the story. Her way of writing has a bit of drama, a bit of romance, and a good bit of humor thrown in through out. I loved the first book I read, and couldn't wait for more. I went and got Against the Tide, it was another fantastic story! Against the Tide was not the story I thought it would be, it was much more! Elizabeth Camden presents to us to very interesting and unique leads, Lydia Pallas and Alexander Banebridge. Lydia was raised on her father's fishing vessel. She knew she was poor, but that didn't matter, she had her family and loved them. However, a few months after arriving to America, Lydia is left alone when her father's ship is lost at sea. She lost her mother, father, and baby brother all in one day. Lydia was sent to an orphanage in Boston. Lydia was the smartest in her family when it came to languages. As an adult, she took that knowledge and applied it to what she wanted to do and she ended up working for the Navy as a translator. In that job, she meets Alexander Banebridge. A former Navy man, now working with the Admiral in charge of Lydia's office. Every time that Bane is in the office, he finds away to disrupt Lydia's desk in some form or fashion, knowing her love of order is her top priority. Bane is a character that can come off one way, but once more is reveled about him, there is so much depth and understanding to why he is the way he is. He is a man who has a passion to right was many wrongs as he has committed in his youth. As a teenager, Bane worked for one of the top opium drug lords in America and worked his way up, but it was the Admiral of Lydia's office and his family that helped him get free of his past life. After finding God, he changed his life and is now passionate to shutting down the opium smuggling and trade in the country. This book shone a light on a part of history that isn't widely known. The free for all of opium in children's medicine. The abuse of the medicine that some children's facilities spoon fed to the children under their care to make them more compliant and the sad side effects to these "children's medicine " had when these kids grew up and the addicts it created. Opium is not just a past ghost in Bane's life, but also the connecting factor he has to Lydia. I loved how the story of Lydia and Bane played out. It was a little different than most stories out there. We get to know both of these characters right off and we find out what drives them. It moves the story in a way that it is hard to put down. Must agree Kate - this story *was* different but oh-so-good. It had every element imaginable and Elizabeth used them all exquisitely. I also felt that Bane was one of the best heroes I've encountered yet - he was noble but flawed and his conversion was true. Like you, I am quite fond of Camden's style (with exception to her second novel which I didn't like as well). Looking forward to 'Whirlwind.' Glad you liked this one! Bane was a hero with so many layers. I love seeing that in a story. Elizabeth Camden really can pull you into a story. I love that her characters are flawed, they are human, but they do their best. Great review! I was happy enough to be able to download this book for free as an e-book, so it's waiting for me to read on my e-reader. I'm very interested in what you mentioned about the opium being used as a medicine, especially for kids. It was actually a story thread in an old(er) BBC show I just watched, called Berkeley Square. Birdie, I hope you enjoy it! I need to check that show out. I never thought much about opium in medicine, now I want to look more into the history.